An encampment under the Eigth Street bridge, a short walk down from the Austin Police Department headquarters. Police hand out tickets for sitting or lying on sidewalks, camping or panhandling, but the city says it's revisiting those laws this year. In the last three years, Austin police have handed out more than 10,000 tickets downtown for things like panhandling, sitting on sidewalks and setting up camps like the one in the shadow of Austin Police Department headquarters underneath the Eighth Street bridge. APD Assistant Chief Justin Newsom said camping is common along the bank of Waller Creek. People set up cots and chairs or just sleep on the ground, piling trash near four pillars next to the trail. He said officers don't often write up people for violating the city's camping ban; a lot of the enforcement for that and other city ordinances is spurred by citizen complaints, which is what happened recently at the Terrazas Public Library. People complained to APD, then officers ran folks off. Newsom said that starts the cycle, as it relates to camps. "We can't win – the police can't win – in this situation." "They go somewhere [else] and create a new camp, which will eventually be a new complaint, which will require us to respond to that citizen complaint at some point and break that camp up. And then where do we send them?" Newsom said. "It's just this revolving door of there's no place for these people to exist. And until we can figure that piece out, we're always going to be chasing our tail." That's not to say people aren't cited for these ordinances. They are. And each ticket costs anywhere from $160 to $210. Most of those citations go unpaid or defendants do community service in lieu of payment. Only 31 of those 10,000 tickets from the last three years were paid outright, according to court records, and 70 percent resulted in arrest warrants. Newsom said police walk a fine line in enforcing the laws. "If we do too much, then people say we're just criminalizing homelessness, and we're un-empathetic, and we don't want to help anybody – we just want to punish. And, if we don't do enough, we get the other side saying that we're all just a bunch of liberals, and we don't want to enforce laws, and we're advocates for the homeless when we should be advocates for the law," Newsom said. "And so, we can't win – the police can't win – in this situation." Austin's not alone. Cities across the country have been reexamining these so-called quality of life ordinances, and their constitutionality has been challenged in court. A few weeks ago, one of those lawsuits succeeded: A federal appeals court effectively struck down bans on sleeping or camping in public in Boise, Idaho. While that decision affects cities only within the 9th Circuit boundaries, the ruling has given new life to a Houston case that's been working its way through the 5th Circuit Court over the past year. "The legal theory of relief that the homeless plaintiffs in Boise pushed is the same theory that our clients are pushing here in Houston," said Trisha Trigilio, an attorney with the American Civil Liberties Union who is leading the case. And that "is that the shelters are full, they have nowhere else to go, and they can't help but meet their basic human need for shelter in public." 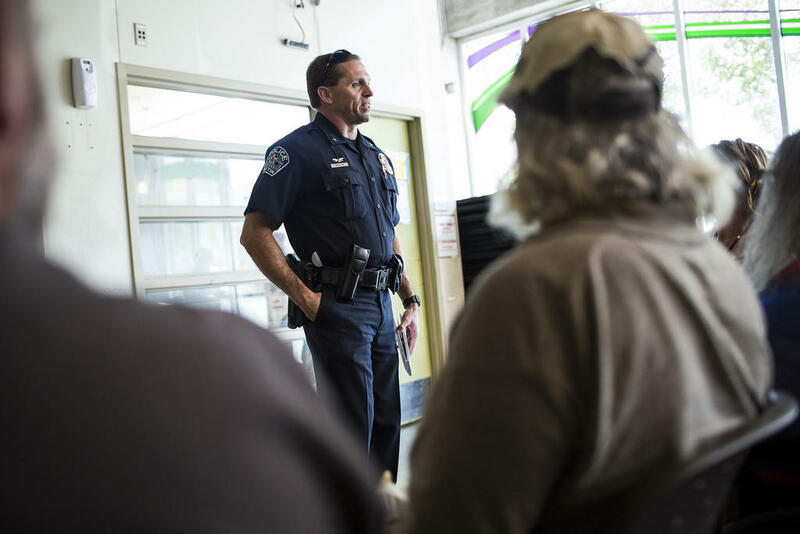 APD Assistant Chief Justin Newsom at an info session at the Austin Resource Center for the Homeless in April 2017. The argument Trigilio and the ACLU are making isn't new. It stems from a 1962 U.S. Supreme Court decision – Robinson v. California – that more or less made it illegal to punish someone for something related to their "status." That precedent was further sharpened a few years later in Powell v. Texas, a case that started right here in Austin, when Leroy Powell was arrested for public intoxication. He appealed his arrest for public drunkenness all the way to the Supreme Court on the basis that he was arrested merely for being an alcoholic who happened to be drunk in public – not for mischievous or criminal behavior. He'd been arrested 73 times from 1949 to 1966 in Travis County – all but one of which was for public intoxication. His attorney, Don L. Davis, argued Powell's history was proof he couldn't control his behavior and that alcoholism was a disease, which was a radical idea at the time. He was arrested for his status as an alcoholic, not his behavior. Arguing for the state, Attorney David Robinson Jr. said that principle would have "few stopping places." "This is a condition," Associate Justice Potter Stewart fired back during oral arguments. "This man wasn't – didn't commit an assault and battery or wasn't guilty of even disorderly conduct ... that's not criminal behavior if you're sober, is it? He didn't do anything that wouldn't be perfectly legal to do, if he were sober, did he?" Stewart's argument that Powell's condition was just that – conditional – was rolled into the dissenting opinion authored by Justice Abe Fortas. The dissent reasoned that if given a choice, Powell wouldn't have found himself in the position in which he was – so prosecuting him under state law would be cruel and unusual punishment under the Eighth Amendment. "It's just too cruel, under our system of democracy, to punish them solely for being homeless." The rest of the court didn't buy it, finding in a 5-4 decision that Powell was drunk in public and that his behavior violated state law. But that dissenting opinion – that people shouldn't be punished for something that's part and parcel of their identity or their present circumstances – started getting cited in cases involving homelessness – namely, the Boise case and the case in Houston, which is heading back to trial. A decision in the Houston case could take years, Trigilio said, but if the court sides with the plaintiffs, Austin's ordinances would be invalidated. While Houston has nearly double the number of homeless people, it has five emergency shelters, she said. Austin has roughly 2,100 homeless people, according to the last count, with only two major emergency shelters to choose from in the downtown area – shelters that hold only a fraction of that number. "When you have a situation like you have there in Austin – where you have many more people than can possibly fit in the shelter – it's just unconstitutionally cruel to punish them for doing the unavoidable," Trigilio said. "So, whether it's sitting or lying down or trying to build some sort of tent or temporary structure, to shield themselves from the weather or from other people, it's just too cruel, under our system of democracy, to punish them solely for being homeless." Earlier this year, the Austin City Council considered revising its ordinances related to homelessness after a series of audits showed enforcing them was an added barrier for chronically homeless Austinites trying to get housed. But those conversations petered out before the Council's summer break. David Green, a spokesperson for the city, said the city will revisit them in this new budget cycle. "We've had a series of meetings with various stakeholders on all sides of the issue, and we kind of decided we needed to take a step back and kind of assess a good, comprehensive way forward," he said. "We haven't done that yet." One of those stakeholders is Newsom, who said in the year he's been assistant police chief of the downtown area, he has spent more time on homelessness than anything else – more than large events like SXSW or Austin City Limits. But, until he's told otherwise, he's going to enforce what's on the books. "We talk about that here because the discussion is up about the panhandling, camping and sit-and-lie ordinance and whether or not it's constitutional or not. Like everything, some people say it's not, some people say it is," Newsom said. "Until a superior court rules on that, we're going to go with it." Correction: A previous version of this post misspelled Trisha Trigilio's first name.